Research has suggested that slashing the holes from the traditional 17 to five could cut the amount people sprinkle on their food by more than half. And so at least six councils have ordered five-hole shakers — at taxpayers’ expense — and begun giving them away to chip shops and takeaways in their areas. Leading the way has been Gateshead Council, which spent 15 days researching the subject of salty takeaways before declaring the new five-hole cellars the solution. 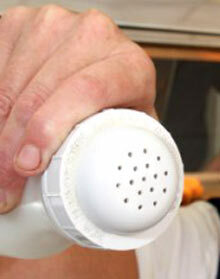 Officers collected information from businesses, obtained samples of fish and chips, measured salt content and ‘carried out experiments to determine how the problem of excessive salt being dispensed could be overcome by design’. 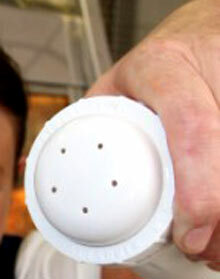 They decided that the five-hole pots would reduce the amount of salt being used by more than 60 per cent yet give a ‘visually acceptable sprinkling’ that would satisfy the customer. A spokesman for the National Federation of Fish Friers called the scheme a “gimmick” and said customers would just shake the containers more. I’m assuming Gateshead Council’s research took account of this effect, although there are so many ways that users’ habits could have been formed through prior experience that this ‘solution’ won’t apply to all users. There might be some customers who always put more salt on, before even tasting their food. There might be people who almost always think the fish & chips they get are too heavily salted anyway – plenty of people, anecdotally at least, used to buy Smith’s Salt ‘n’ Shake and not use the salt at all. And there are probably plenty of people who will, indeed, end up consuming less salt, because of the heuristic of “hold salt shaker over food for n seconds” built up over many years of experience. Overall: I actually quite like this idea: it’s clever, simple, and non-intrusive, but I can see how the interpretation, the framing, is crucial. Clearly, when presented in the way that the councils media have done here (as a government programme to eliminate customer choice, and force us all down the road decided by health bureaucrats), the initiative’s likely to elicit an angry reaction from a public sick of a “nanny state” interfering in every area of our lives. Politicians jumping on the Nudge bandwagon need to be very, very careful that this isn’t the way their initiatives are perceived and portrayed by the press (and many of them will be, of course): it needs to be very, very clear how each such measure actually benefits the public, and that message needs to be given extremely persuasively. Final thought: Many cafÃ©s, canteens and so on have used sachets of salt, that customers apply themselves, for many years. The decision made by the manufacturers about the size of these portions is a major determinant of how much salt is used, because of the unit bias (people assume that one portion is the ‘right’ amount), and, just as with washing machine detergent, manipulation of this portion size could well be used as part of a strategy to influence the quantity used by customers. But would a similar salt sachet strategy (perhaps driven by manufacturers rather than councils) have provoked similar reactions? I’m not sure that it would. ‘Nanny manufacturer’ is less despised than ‘nanny state’, I think, certainly in the UK. 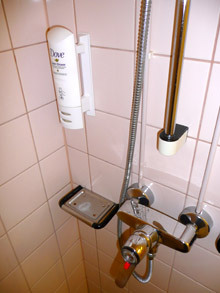 The plastic* of this built-in Dove shower cream bottle I encountered in a Finnish hotel recently was significantly stiffer than the consumer retail version. The idea is that you press the side of the bottle where indicated to dispense some cream, but it didn’t deform anywhere near as easily as expected, with the result that the ‘portion size’ of the product was much smaller than you might dispense if you were at home. Is this deliberate? The hotel wants to spend less on Dove, so it wants customers to use less of it, and the manufacturer obliges by making a bottle that’s more difficult to squeeze? Whereas with the retail version, the manufacturer wants the customer to use as much as possible, as quickly as possible? Is it a similar (but inverse) tactic to the Lather, Rinse, Repeat effect? Or am I reading too much into it? Is it just that the bottle is going to have to last longer, with multiple refills, so stiffer plastic’s used? 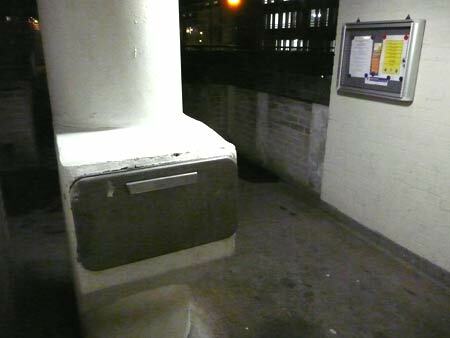 This is a communal rubbish chute serving a block of flats. 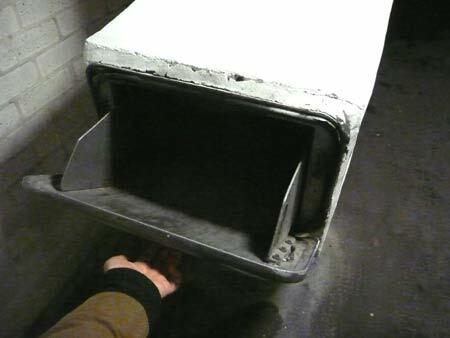 The cross-sectional area of the aperture revealed by opening the hatch should be smaller than the cross-sectional area of the chute itself, so there’s less chance of rubbish bags getting stuck, even when someone crams one in. That aperture dimension is important. It (to a large extent) determines the volume of rubbish that can be thrown away in one go. That in turn determines the size of the bins that users of this chute will (probably) have in their houses or flats, and thus how often the bin will have to be emptied. Taking the rubbish out can be a chore; halving the bin size doubles the number of trips to the chute, doubles the inconvenience. It is, therefore, more desirable not to throw too much away. At the very least, having a smaller bin will make users aware more often of just how much waste they’re generating. But does that have any measurable effect on purchasing decisions in the first place, assuming that more minimally packaged products are available as an alternative to those with excess packaging? How strongly coupled are the (limited) affordance of a smaller bin, and, at a couple of removes, in-store decisions? Is that rubbish bin, or indeed the chute aperture itself a social actor, a messenger, capable of persuading people to change their behaviour purely by existing with one set of dimensions rather than another? Effectively, do people with smaller rubbish bins in their houses consciously buy items with less packaging? Where else is this modified affordance -> inconvenience -> behaviour change pattern used as a strategy? As with making parking spaces deliberately smaller to make owning a large vehicle less convenient, the strategy may have some potential. A tilt-detector from this 1984 US patent, with intended application on a packing box. The liquid detection stickers in mobile phones, which allow manufacturers and retailers to ascertain if a phone has got wet, and thus reject warranty claims (whether judiciously/appropriately or not), seem to be concerning a lot of people worldwide. Around a quarter of this site’s visitors are searching for information on this subject, and the comments on last October’s post on the subject contain a wealth of useful experience and advice. This current thread on uk.legal.moderated goes into more depth on the issue, and how the burden of proof works in this case (at least in the UK). While informed opinion seems to be that the stickers will only change colour when actual liquid is present within the phone, rather than mere moisture or damp, this may well include condensation forming within the casing, as well as the more obvious dropping-of-phone-into-puddle and so on. The main point of contention seems to be that the sticker may change colour (perhaps gradually) and the phone continue working perfectly, but when an unrelated problem occurs and the phone is taken in for repairs under warranty, the presence of the ‘voided’ sticker may be used as a universal warranty get-out even if the actual problem is something different. 30 years in the IT industry and associated customer service tells me they are trying it on and most people buy it. In the olden days, hardware used to come with a similar red dot system indicating the kit had been tilted more than 45 degrees and the manufacturers claimed the kit could not be installed and had to be written off. Of course, 99.9% of the time the kit was fine, but they had a get-out from a warranty claim or so they thought. When the buyers tried to claim on their insurance or against the transport companies insurers the loss adjusters got involved and invariably the kit was installed and worked fine for years rather than the insurers paying out. …it is desirable that the tilt detectors not be resettable. In particular, it must be possible to combine a package with at least a pair of the tilt detectors such that attempting to reset one would cause the other to be tilted beyond its pre-determined maximum angle so that the total combination would always afford an indication that the tilt beyond that allowed had been effected. This is something of a poka-yoke – but as with the phone liquid-detection stickers, it’s being used to detect undesirable customer/handler behaviour rather than actually to prevent it happening. Other than making a package too heavy to tilt, I am not sure exactly how we might design something which actually prevents the tilting problem, aside from rectifying the design problem which makes tilting a problem in the first place (even filling the airspace in the case with non-conductive, low-density foam might help here). But there’s certainly a way the tilt-detector could be improved to help and inform the handler rather than simply ‘condemn’ the device. For example, it could let out an audible alarm if the package or device is tilted, say, 20 degrees, to allow the handler to rectify his or her mistake before reaching the damaging 45 degrees, whilst still permanently changing colour if 45 degrees is reached. In the long run, it would probably help educated users about how to handle the device rather than just ‘punishing’ them for an infraction. 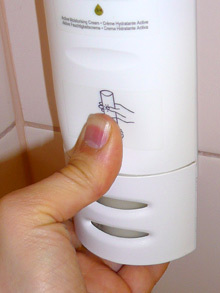 I’m sure that mercury-switch (or whatever the current non-toxic equivalent is) alarms have been used in this way (e.g. on a vending machine), but how often are they used to help the user rather than alert security? 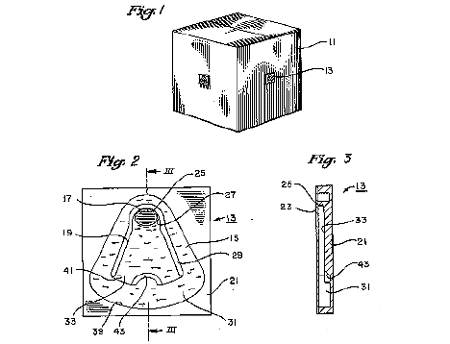 The patent description goes on to mention using tamper-evident methods of attaching the detectors to the device or packaging – this is another interesting area, which I am sure we will cover at some point on the blog. A couple of weeks ago we looked at casino carpet design – a field where busy, garish graphic design is deliberately employed to repel viewers, and direct their attention somewhere else. Ben Hyde commented that deliberately unattractive “background music, lighting, seating, and color schemes in large malls” may be used to drive shoppers into the quieter surroundings of the actual stores, which certainly rings true in some cases I can think of. On another level, though, A comment by Kenshi drew my attention to the dazzle camouflage used in the First World War, which is quite startling, in a brilliantly bold way. Roy R Behrens‘ book, False Colors: Art, Design and Modern Camouflage, from the website of which I’ve borrowed these images, looks extremely interesting, and I will certainly be ordering a copy when I have the budget. Developed in Britain by Norman Wilkinson and in the US by Everett Warner and Frederic Waugh, the dazzle techniques were intended to make “a single thing appear to be a hodgepodge of unrelated components,” as Behrens puts it in this fascinating article. The aim was that such visual disruption would cause confusion and make it difficult for the enemy to identify what kind of ship – and what size – it was from a distance, with the use of ‘reversed perspective’ in the patterning a part of this. The ship’s course – and angle to the viewer – would also be problematic to identify, with colouring including bright whites, blues and sea-green alongside black, darker blue and grey selectively helping parts of the ship to blend into the seascape, and other parts very much stand out. Breaking the enemy’s ability to distinguish elements of the ship properly, and generally to cause distraction and make it difficult to concentrate on observation for protracted periods, were all part of this plan; painting ships with different dazzle patterning on each side made identification even harder. Despite being likened to Cubism disdainfully by some contemporary journalists, the processes used for designing the camouflage were developed both analytically and empirically, and extensively tested before being applied to the real vessels. Nevertheless, there are certainly elements in common between dazzle techniques and parts of Picasso’s and others’ work; Behrens has written further on the interactions between Cubism, Gestalt theory and camouflage (both in nature and man-made). Intriguingly, the right-hand image above, with the bold blue and white stripes, has something in common with an everyday livery familiar to tens of millions of British shoppers: the iconic Tesco Value branding (below), at least in its original form. I’m not suggesting an actual link, but as we will see, there is something in common in the intentions behind these disparate methods of influencing viewer behaviour. Tesco Value Beans. Image from Plap man on Flickr. The difficulty is that if some of your products are cheap, you may lose money from customers who would willingly have paid more. So, businesses try to discourage their more lavish customers from trading down by making their cheap products look or sound unattractive, or, in the case of Starbucks, making the cheap product invisible. The British supermarket Tesco has a “value” line of products with infamously ugly packaging, not because good designers are unavailable but because the supermarket wants to scare away customers [from the Value products] who would willingly spend more [on other brands, or Tesco’s ‘normal’ private label products]. Whereas the dazzle camouflage was intended to confuse and disconcert the viewer, the thinking behind the Tesco Value graphics (I would love to know who designed the original style) thus appears to be to disconcert or repel certain viewers (customers) so that they pick a higher-priced alternative (usually on the shelf just above the Value items – Tesco’s planograms have thinking behind them), while allowing immediate segmentation – those customers looking for the cheapest products possible find the Value products easily. There can’t be many retail situations where pretty much the same products can be sold successfully at two different prices on the same shelving unit just because of differing packaging graphics, but it seems to work for Tesco, in the process creating a significant meme. Left: a ‘Tesco Value’ tattoo, from this B3ta thread There have been many others. Right: Rich Boakes’ ‘Tesco Value’ greetings cards have been widely imitated, and could even have inspired this effort from Asda. Updates to the Tesco Value branding in recent years have reduced the intensity of the blue stripes and brought the style closer to other supermarkets’ ‘value’ brands, which all tend to be similarly sparse (e.g. Sainsbury’s Basics, below), but the Tesco style is still the most distinctive. McDonald’s, Toledo, Ohio, 1967. Image from DRB62 on Flickr. We’ve looked previously at the effect of portion/packaging sizes as a ‘choice of default’ architecture of control, and I’m aware that I have not yet reviewed Dr Brian Wansink‘s excellent Mindless Eating, which examines this and other psychological aspects of the way we eat. I will do this in due course. …The soda makers don’t deserve credit for the invention of super-sizing. That distinction belongs to a man named David Wallerstein…[who] in the fifties and sixties …w orked for a chain of movie theaters in Texas, where he labored to expand sales of soda and popcorn – the high mark-up items that theaters depend on for their profitability. As the story is told in John Love’s official history of McDonald’s, Wallerstein tried everything he could think of to goose up sales – two-for-one deals, matinee specials – but found he simply could not induce customers to buy more than one soda and one bag of popcorn. He thought he knew why: Going for seconds makes people feel piggish. Wallerstein discovered that people would spring for more popcorn and soda – a lot more – as long as it came in a single gigantic serving. Thus was born the two-quart bucket of popcorn, the sixty-four ounce Big Gulp, and, in time, the Big Mac and the jumbo fries, though Ray Kroc himself took some convincing. In 1968, Wallerstein went to work for McDonald’s, but, try as he might, he couldn’t convince Kroc, the company’s founder, of supersizing’s magic powers. Kroc remained skeptical, so Wallerstein went looking for proof. He began staking out McDonald’s outlets in and around Chicago, observing how people ate. He saw customers noisily draining their sodas, and digging infinitesimal bits of salt and burnt spud out of their little bags of French fries. After Wallerstein presented his findings, Kroc relented, approved supersized portions, and the dramatic spike in sales confirmed the marketer’s hunch… One might think that people would stop eating and drinking these gargantuan portions as soon as they felt full, but it turns out hunger doesn’t work that way. Researchers have found that people (and animals) presented with large portions will eat up to 30 percent more than they would otherwise. As I say, we’ll come back to this and similar issues in due course, but I think it’s worth bearing in mind the implications of the unit bias phenomenon within design generally. Where else does it apply?